Dr. Stephanie Lauer was raised in Columbus, having lived in the suburb of Westerville until she attended Miami University in Oxford, Ohio for her undergraduate education. She graduated from Case Western Reserve School of Dental Medicine and has completed a general practice residency program at the Louis Stokes VA Medical Center in Cleveland. 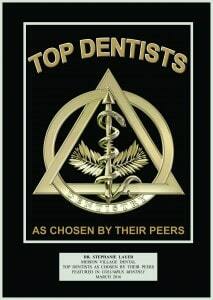 Dr. Lauer is a member of the Omicron Kappa Upsilon National Dental Honor Society, American Dental Association, Ohio Dental Association and the Columbus Dental Society. As a member of the American Academy of Dental Sleep Medicine, Dr. Lauer enjoys treating patients that suffer from sleep apnea. Dr. Lauer’s husband, Dr. Kevin Weitzel, also attended Case Western Reserve School of Dental Medicine and went on to obtain a master’s degree and a degree in pediatric dentistry from The Ohio State University and Nationwide Children’s Hospital. He is currently practicing pediatric dentistry in Hilliard and Marysville, Ohio. When not practicing general family dentistry, Dr. Lauer enjoys spending time with her husband and two young children, Thomas and Evelyn. In 2016, Columbus Monthly magazine recognized Dr. Lauer as one of the Top Dentists in central Ohio!